You no longer have to practice your putting at home with cheap plastic ball return machines. Modern devices offer much more realistic surfaces to practice on. We take a look at some of the best indoor putting greens for the home on the market today. There isn’t an avid golfer among us who isn’t trying to wring a little more time out of a day to work on his or her game. With the daily demands of life, getting to the range can be impossible during the workweek. Luckily the golf industry has seized on this need and created a multitude of products that enables the weekend warrior to practice anytime and anywhere. From devices such as swing analyzers that fit on a club to backyard training nets, any golfer can keep the muscles loose and trained for an upcoming 18 holes. But what about the short game? And more specifically what about the putting green? We all try to make the best out of the carpet in the office or the hallway leading to the master bedroom but when that doesn’t cut it where can the golfer turn to work on his putting? Our first entry on the list of home indoor putting greens is the extremely durable system from 77tech. Featuring several different models, 77tech’s most popular indoor green measures over three meters long allowing the golfer to work on those moderate length putts, crucial to a final score. Coming with two or three holes, the 77tech is roomy enough for a sustained practice session but also wide enough for two friends to challenge each other to a contest. But what’s really attractive about the 77tech is the construction. The green is plush and padded with edges that simulate short rough. Underneath, the system sports a high quality rubber mat lined with spikes that help grip the green to any surface. The rubber spikes allow the mat to stay flat and prevents wrinkles after repeated use. Holes on the green have flags attached and a slight depression to safely grab incoming putts. The green is easy to store and can be unrolled for quick playing in seconds. And don’t worry if you decide to take the green outside, the mat is completely washable. If you are looking for simplistic yet sturdy, then the Putt-A-Bout indoor putting green is the model that is tailored for you. Shaped like a kidney the Putt-A-Bout is three meters in length and one meter in width. 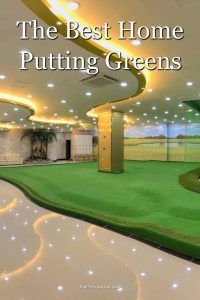 Sporting three holes for the golfer, this putting green is long enough to work on the medium length rolls but is best suited for honing your skills at those tricky two meter par putts. The feature that most golfers like is the long bunker shaped cutouts that stretch behind the holes to catch any wayward putts. The final half-meter of the mat is raised with extra padding to help slow down balls as they approach the hole. Everything about this mat screams convenience and for the reasonable price tag, it’s a winner that golfers will come back to again and again. From the very popular company SKLZ comes the Accelerator Pro indoor putting green with a very cool additional feature, a ball return for all those made putts. Stretching over three meters long, the Accelerator Pro is the thinnest green on this list with a width of less than half a meter. The mat’s primary design is for the golfer to work on cleanly striking the golf ball along a path. If you find yourself having trouble getting the ball on the right line to the hole, then this is the mat that can shore up that issue. On the mat at intervals of one, two and slightly less than three meters are directional arrows that help keep the putter aligned with markers for your backswing and follow through. This is a putting green that encourages repetition and truly offers a distinct way to get better around the cup. And, as we said before, putts that find their way to the bottom of the hole are returned alongside the putting green via a track. LEVELGOLF has come up with an ingenious way to help reduce your strokes on the green with the Dual-Track Pro Edge indoor putting green. What makes the Dual-Track so unique is its design. The over three meter mat is divided into two halves. On one side is a regular green with a smaller than regulation 7.5cm hole. On the other side is a path lined with a white stripe that offers a 5cm hole. The green is designed to demand precision from the golfer. A regulation cup is close to 11cm wide but with the smaller holes, the Dual-Track forces putts to be hit on-line and with tremendous accuracy. Similar to the SKLZ, the LEVELGOLF model offers a ball return system for made putts which allows for efficient practice. Durable and simple to roll and store, the Dual-Track is highly affordable for the unusual practice method it provides. Last entry on our list of best indoor putting greens for the home is the VariSpeed putting system from ProActive Sports. When you first glance at the VariSpeed green it resembles an American Football field with lines, numbers and differing colors of green. But don’t let the interesting layout fool you, this is a great indoor green for improving your game. What is terrific about the VariSpeed green is its flexibility. The green can be tailored for putts of varying length, speed and break. It comes with a brush that allows you to smooth the grain of the artificial surface so that you can track the path of your putts. If you are looking for an indoor green that doesn’t get boring then the VariSpeed is more than qualified to handle the job. Nowadays, there’s no need to worry when you can’t find the time to get down to the range to practice your game. You can work on your putting from the comfort of your own home whenever you’ve a spare bit of time. We’ve looked at five of the best indoor putting greens on the market today, any of which are sure to help improve your performance on the greens and hence lower your scores.